Fish, including sardines and tuna, is a healthy food that provides you with omega-3 fatty acids and other beneficial nutrients. The American Heart Association recommends that you consume at least two 3.5 oz. servings of fish per week. However, concerns exist over possible contamination with mercury, PCBs and other contaminants. Sardines are one of the types of fish that contain the least mercury, according to the National Resources Defense Council, so you can consume sardines to meet your recommended intake of fish. The U.S. Environmental Protection Agency does recommend that women and children limit fish consumption to an average of 12 oz. per week, regardless of the type of fish you consume. The amount of tuna it is safe to consume depends on the type of tuna you choose. Skipjack tuna and canned chunk light tuna contain moderate levels of mercury, so you should consume no more than six 3.5 oz. servings per month of these fish. Yellowfin tuna and canned albacore tuna are high in mercury, so limit your consumption to three 3.5 oz. servings or less per month. Bigeye and ahi tuna contain the highest amounts of mercury, so avoid these types of tuna altogether. A 3.5 oz. 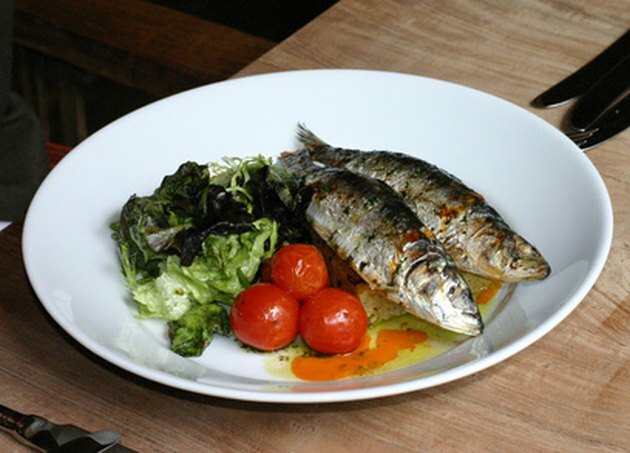 serving of sardines canned in oil contains 210 calories, 24 g of protein and 10 g of fat, including 2 g of saturated fat. Sardines are a good source of vitamins B-12, niacin and D, and the minerals phosphorus and calcium, and also provide you with some riboflavin, iron, zinc, magnesium, vitamin B-6, thiamine, vitamin A and folate. A 3.5 oz. serving of tuna canned in water contains 120 calories and 25 g of protein. Tuna is a good source of niacin and vitamin B-12, and provides you with some vitamin B-6, phosphorus, magnesium, iron, zinc, riboflavin and thiamine. Although sardines are higher in calories than canned tuna, they provide more vitamins and minerals and more omega-3 fats. Albacore tuna from the U.S. or Canada and yellowfin tuna from the U.S. are both more environmentally friendly and better sources of heart-healthy omega-3 fats than canned light tuna or canned albacore tuna.